Working with Student Teams is a mutually advantageous situation for all parties involved. A Florida SBDC at USF business client provides the team with financial and other organization details, the Florida SBDC at USF provides value-added service to the client, and the client gets a no-cost plan as a result. Each project is assigned a Florida SBDC at USF business consultant to oversee the project. Our main interest is to ensure that the client will receive an adequate plan at the end of the semester. Become a client with the Florida SBDC at USF. The FSBDC at USF provides no-cost business consulting services to businesses within the 10-county regional area. Becoming a client consists of filling out an electronic Request for Consulting form and being input into our database. All information provided directly to the FSBDC at USF will be regarded as confidential. By Federal mandate, we do not sell or give out our database. Agree to meet with the Student Team (usually a small team of 5-6 students pursuing a bachelor’s or master’s degree in a business-related field at a locally accredited University. You’ll meet a few times at the beginning of the semester. You can continue to communicate with the team via e-mail and telephone to provide sufficient information about your business to the students to make the marketing plan useful for you. Accurate financial information, in the form of company financial statements, might be required by the students and the FSBDC at USF at the beginning of the project so that accurate, realistic industry analysis and growth projections can be developed. Agree to provide to the FSBDC at USF copies of all information provided to the Student Team, and a copy of the report. Include the FSBDC at USF consultant in all communications. 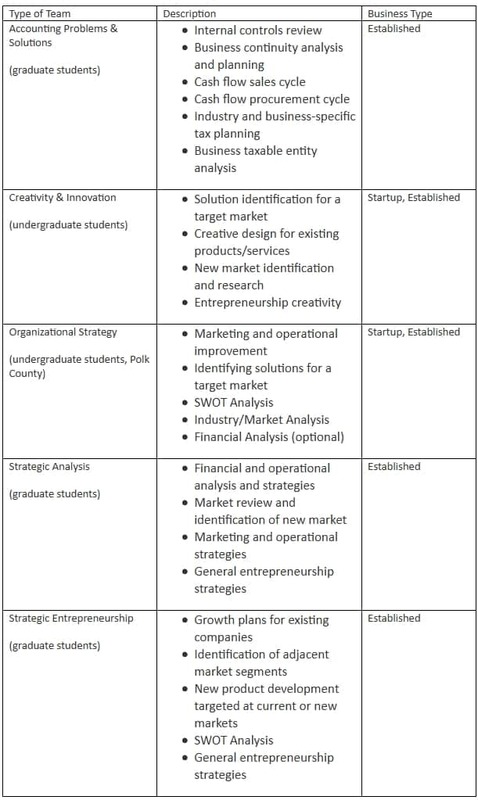 All students in the team will sign the Florida SBDC at USF Conflict of Interest form or one generated by the University prior to starting on projects. However, a copy of the report will be provided to you, a copy will remain at the Florida SBDC at USF office and the students will turn in a copy to their professor. These reports are not distributed to any entities. Only other students, and the professor, will have access to them. A Florida SBDC at USF consultant will be assigned to your business and will participate in this program. Once assigned, clients can contact him/her with any questions regarding the program, or for further assistance with the business. Note: Please note that some class classes are not offered every semester.